With Jupiter now moving forward since May 10th, and Mars also moving direct since June 30th we can feel the momentum accelerate us more and more towards a future still unknown given the Saturn retrograde square Neptune retrograde, and the Uranus direct still square Pluto retrograde. 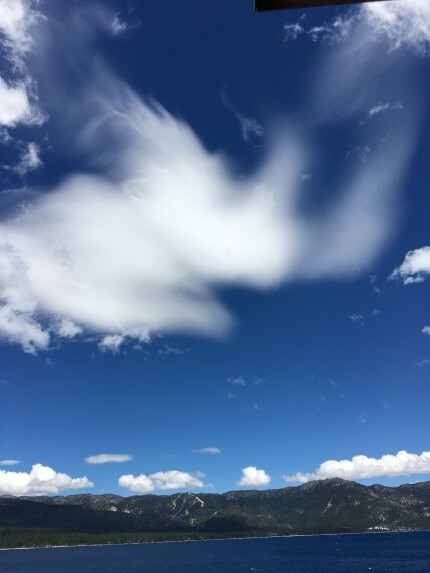 Much of these energies are mirrored in the collective events unfolding on the world stage, but most of us continue to watch our own personal lives and where we respond to these changing cycles of direct, stand still, retrograde, stand still, and direct again. Let’s start with Mars finishing up its movement through Scorpio and getting ready to re-enter Sagittarius for the final time. I refer you to my initial article “Your Mars Guide for 2016” (January 26, 2016) for the full story. Wherever Mars energy has been hammering you these past 7 months it’s about to end! Are you relieved or sad to see it go? That probably depends on what the aspects have been while it catalyzed a certain place in your own life. Mars enters Sagittarius on August 3rd and leaves that sign for another two years on September 27th. Every Mars cycle is about an energetic thrust towards something. While Mars is in Sagittarius set goals for yourself and let Mars work with Saturn, also in Sagittarius, to discipline your energies and get a lot done. Don’t allow Neptune to syphon off those energies, dissipate them, or get you addicted to wasting time, escaping from your intentions, or seducing you into scams or deceptions. Once Mars gets into Capricorn, if you have disciplined your energy, you’ll get the results you are after. Jupiter in Virgo is now traveling fast forward from the mid-degrees to the end of the sign by the first week in September. See my past article “Jupiter in Virgo; What Will It Mean?” (August 7, 2015) for a pretty complete description of this passage. This Virgo energy has expanded the means of attending to detail after detail, and approaching life with a ‘can do’ attitude. It continues to be a good time to repair things, work on diet and health issues, and get your life in order. By late August I’ll write about Jupiter in Libra, and that is where it will be when the next President of the United States is elected. Saturn in Sagittarius is moving slowly back from where it turned retrograde back in March at 16+ Sagittarius to it’s final stationary turn-around at 9+ Sagittarius. Please review my past article “It’s Time to Refocus Our Aim” (January 13, 2015) and also “Saturn in Sagittarius and Neptune in Pisces; Form and Formlessness’ (April 8, 2015) for a greater understanding of this aspect which millions are now being born with. For me it gives us pause to look at the sorrows of the world and attempt to harness compassion with optimism to relieve some of the suffering around us rather than compounding it by our neglect, ignorance, or sheer lack of concern. Jupiter is about to leave this mutable dilemma so that all that will remain will be these two struggling to make sense of much that is dissolving away in our world today. Make note that this square continues unabated until after November when Saturn finally moves out of orb with squaring Neptune. Saturn turns direct on August 13th. Watch what it represents in your life where reality checks, hard work, and needed discipline are themes. Chiron plus the outer planets do a much slower dance. It’s worth noting that Chiron will turn direct in early December at 20+ Pisces. The healing and bridging necessary right now has been at work on many imperceptible levels to the general population. Pisces is both dissolution and unification. What needs to dissolve in your life? What needs to become more unified? Either process can be healing if that is your intention. Uranus is direct only until July 30th when it goes retrograde at 24+ Aries. The clash of cultures, races, ethnicities, class hierarchies have been most visible of late as Uranus continues to square Pluto retrograde with a lot of lead time since Uranus is now moving fast ahead by about 8 degrees. Once it goes retrograde will the rising up of individual rights to freedom continue? Both the pioneer and the zealot are embedded in this symbolism. Certainly we’re seeing great pioneering movements forging us into Uranian skies of technological possibilities and human potential wonders, but we’re also seeing enormous spin-offs into intense rebellion against anything too traditional (that square to Pluto in Capricorn) which leave upheaval and mayhem in their wake. Neptune in Pisces stays retrograde until November 20th when it finally turns direct at 9+ degrees. Themes run the spectrum from total chaos to vast understanding and enlightenment, but the specter of global warming is upon us all as living species on planet earth. Probably once Neptune turns direct there will be even more dissolution of entire eco-systems that Saturn will no longer be able to defend against. I know I wrote in my last blog about the alarming rise of dying trees here in Northern California. It has reached a frightening level today as I write. I was just up at Lake Tahoe over the weekend and the Sugar Pines, the Ponderosa Pines, as well as Cedars are now dead, dying, or beginning to show signs of demise. There are many probable causes of this linked to the draught, global warming, as well as massive geo-engineering. But this is too Neptunian vast a subject for this synopsis. I refer you to this recent article in the SF Chronicle discussing the implications of 66 million dead trees now plaguing our state. This is probably only the tip of what will be a major disaster in this land of abundance because more and more are ready to die as I write. Which takes us finally to Pluto in Capricorn continuing to stay retrograde until September 27th when it will turn direct at 14+ Capricorn. Pluto does concern itself with transformations. What exactly is a transformation? It is a change, an alteration, a mutation. It can be a shift or a deviation. We witness much written about shifts now. Are these shifts for the better or the worse? Much depends on your own perspective. 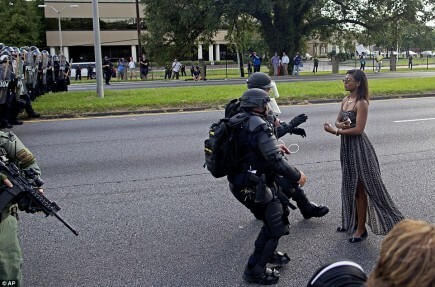 We do see extremes now. This is an intense time indeed. My recommendation is to focus on love. Focus on who you love, what you love, and how you love. If we all do that we’re more likely to take the high road rather than the low. Love permeates all signs, all planets, and all aspects as far as I’m concerned. So I choose love above everything else. It’s hard work sometimes to be as loving as I’d like to be. It is a practice that does require conscious attention, but it is the only principle that makes sense to me in a world that is rapidly changing all around me. 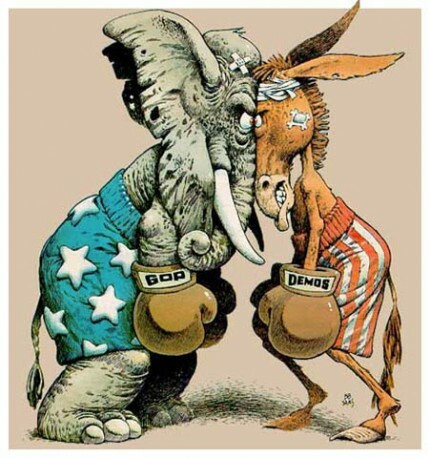 I’ll end with a brief look at the two political conventions coming up fast this month. Both commence within a week of each other. Let’s look first at the GOP (Grand Old Party) Convention convening on July 18th at 1 pm in Cleveland, Ohio. This is a Libra Rising chart with Venus high in the sky next to Mercury in Leo forming the apex of a Yod with Moon in Capricorn and Neptune in Pisces. This convention is a pivotal turning point for the GOP with a great deal of uncertainly as to where a clear focus should be. With Uranus in Libra’s 7th house anything could happen. Uranus is the joker in the deck and no easy aspects form with this energy, in fact that Mars in Scorpio in-conjunct Uranus in Aries continues to be troublesome with aggressiveness and unpredictability the norm. What strikes me is the abundance of water however. There is a Grand Trine between the Sun in Cancer, Mars in Scorpio and Chiron in Pisces. Emotions will be strong! With Moon conjoining Pluto both in trine to Jupiter it does seem to mirror the theme Mr. Trump promotes of ‘making America great again’ with the emphasis on ‘again’. The pull is towards the past in some sense. Will this party unify? Neptune in Pisces squares Saturn, of course. That in-conjunct with Mercury gives us doubts. Many egos are bidding for the limelight it would appear with Leo at the apex. Chiron in a quintile with the Moon in Capricorn can be either creative or destructive where unification is concerned as well. And then there’s the ‘joker’ to contend with!! Quite a complex chart with the sure bet of high emotions holding sway. The Democratic Convention begins a week later on July 25th in Philadelphia, Pennsylvania. I still can’t find the opening time, so I”ve run it for 1 pm to match the GOPs. By now we see the Sun in Leo and a strong fiery Grand Trine between 6 planets and one more out-of-sign!! One Grand Trine involves Sun trine Mars in late Scorpio, trine Saturn trine Moon. That’s harmony between male/female energies and the status quo. We also see a Grand Trine between the Venus/Mercury in Leo with Saturn and both Moon/Uranus. It would appear that a lot of strong female energy holds sway, and of course we know who the presumed candidate will be; a woman. Fire is generally ascribed to vision, passion, and enthusiasm, and this is a fiery chart. That Moon conjoining Uranus shows an enormous difference in contrast to the GOP convention’s Moon conjoining Pluto. Progressiveness is most decidedly a theme here even though a strong out-of-sign T-square is in evidence with Sun square Uranus (but in the same element mitigating the conflict) and Pluto squaring both Uranus and the Moon. Both conventions show Pluto trine Jupiter indicating that vast sums of money are involved behind the scenes. 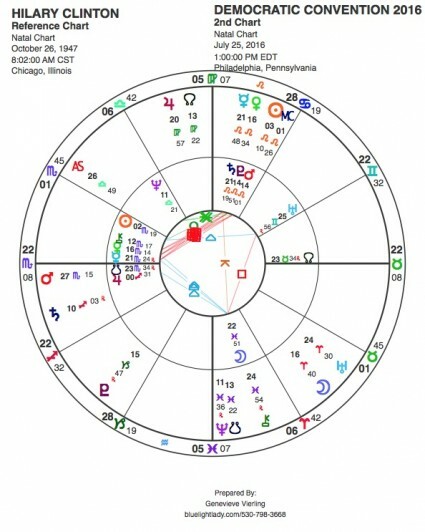 The Democrats have a Jupiter in conjunct the Moon which may be the adjustments the more radical left must make to align themselves with the Jupiter/Pluto elite. Both charts show plenty of in conjuncts which are always tricky and fraught with untold adjustments in timing and energies. Hilary Clinton is pumped up to persevere with transit Mars in her 1st house and Saturn there as well in trine to her Mars/Pluto in the 9th. Her stamina is impressive for a woman pushing 69 years. The convention illuminates her 9th house of global relationships, and all her Leo planets while Jupiter rides high in her 10th house of public service getting ready to expand over Neptune by election time and activate her opportunistic sextile with those 9th house planets. Pluto is also bringing her opportunity with vast reservoirs of hidden wealth and support as it moves through her second and sextile her Scorpio planets. We see her powerful and obsessive Scorpio/Leo squares activated strongly at this time. There is hidden sacrifice, however, that only those closest to her would know about, and that is in evidence with Chiron going over her Moon in Pisces in her 4th house. What are the wounds that may be invisible, that the public simply doesn’t see? Scorpios generally keep those secrets to themselves and Leo is known for licking its wounds in private. 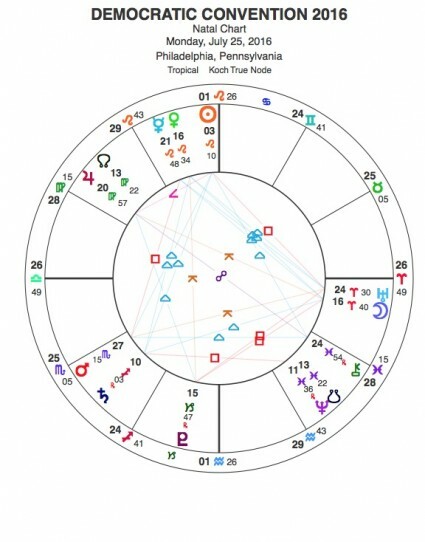 Donald Trump, on the other hand, has the convention Sun illuminating his Venus/Saturn in Cancer which is perhaps his ambition to truly find his place in the world and ‘belong’. Jupiter moving through his 1st house is sweeping him along, however Mars and Saturn are push him down into his 4th (the most obscure place) with transit Saturn beginning to oppose his Uranus/NorthNode/Sun and move over his SouthNode/Moon starting in November. Trying so hard to belong yet needing a great deal of freedom (Moon in Sagittarius) is a conundrum for him I’m sure. Saturn is sure to corral him should he win. And what about transit Pluto creeping ever surely towards an opposition with his Saturn/Venus as well as squaring his Jupiter in Libra and in-conjunct his Sun in Gemini? There are powers ahead more vast and controlling than he probably can fathom, but should he reach the pearly gates of the White House, he may become keenly aware of what they require of him. And then there’s the United States itself. 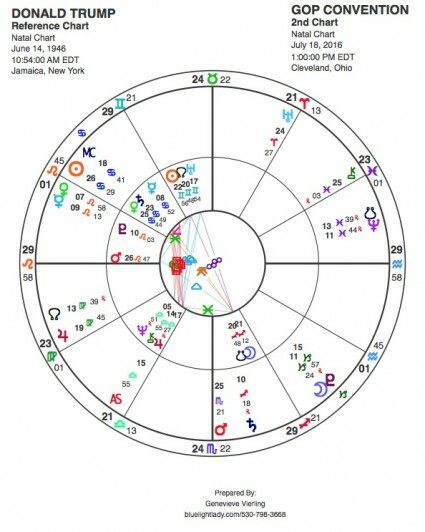 The GOP convention illuminates the Mercury opposite Pluto in the nation’s chart indicating the play for power that controls the media as well as the voice of the people. With Jupiter going over Neptune this is theater at its most outrageous and disorienting! 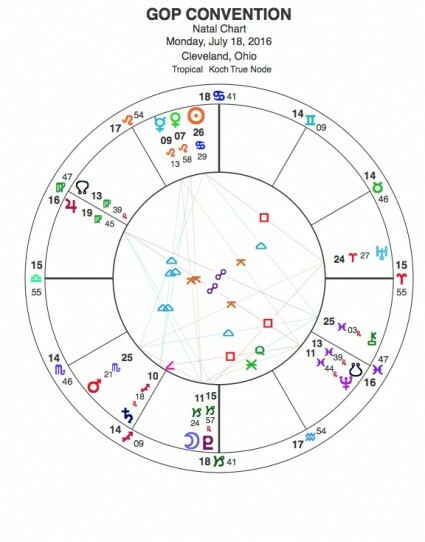 Same goes for the Democratic convention, but by then the Sun in Leo is illuminating the North Node in Leo in the nation’s chart shining light on the royal succession of power at play in a nation still under the illusion that this is a true democracy. Transit Saturn hovers now close to the Ascendant as Neptune squares it. Reality and illusion are difficult at best to separate, but Neptune wins as it dissolves away the old forms in readiness for an unknown future. Where is America going with these changes? There still is a struggle going on between the ideals of democracy as depicted by the Moon in Aquarius forming a Yod apex with Neptune sextile Mercury, and the plutocracy of hidden, elite power as depicted by Pluto in Capricorn opposite Mercury and square Chiron. The long standing racial issues now coming to the surface, once again, show how far this nation has to go before there is truly equal rights for all as stated in the constitution. Transit Uranus has awakened the ‘wound’ of Chiron in Aries and now it further awakens of voice of Mercury, but Pluto continues to guard secrets still to be revealed of how power really works in this nation. Pluto sits Retrograde at the 27th degree of Capricorn while the Moon sits at 27 degrees of Aquarius. Side by side they exist like two fingers on the same hand; another paradox to ponder. Excellent information on “Energies Clip Ahead Now While Saturn and Neptune Continue to Keep Us Holding Our Breath”. The content in this article is very relevant and easy too.